With leaves falling from the trees and covering the ground in a warm blanket of color, fall is a perfect time for family pictures. The cooler temperatures mean no one is sweating to death, the colors add great "pop" to your images and the images make your Christmas cards beautiful. This location was the at a friend of the family's home. Lots of oak trees with a rolling feel to the entrance made it a great venue for this session. One of the keys to family sessions is let each person's personality shine through without overwhelming the entire picture. For me, when doing a family session, I get everyone where I want them in the picture and let them choose how to stand. It gives the feeling of being a candid image, without it truly being candid. These guys were naturals at doing that, so the lack of posing wasn't a hinderance. 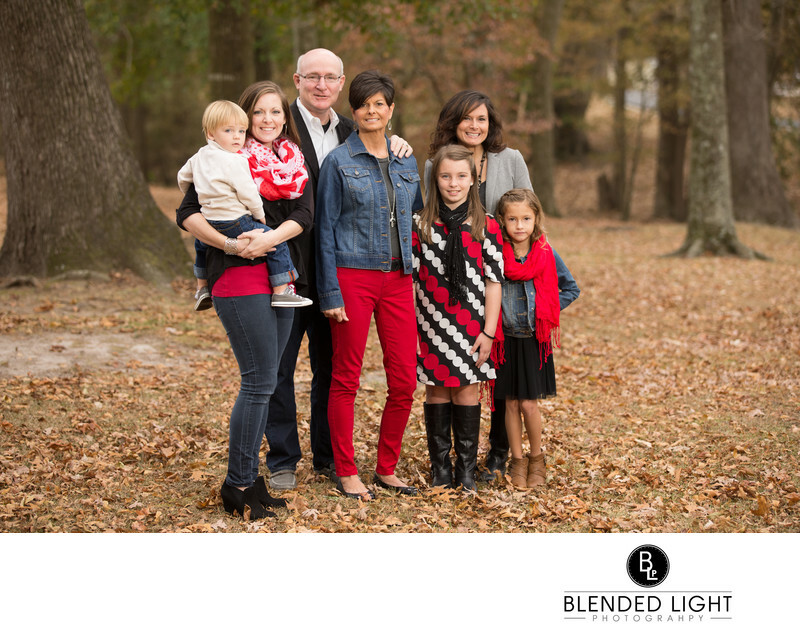 Since the sun was hidden by the trees, I wanted to create a little extra light to ensure that family really stood out. With a little off camera flash to their left, I got just the right amount of power to keep the natural looking and ensure they stood out in the image. 1/80; f/3.2; ISO 50; 102.0 mm.